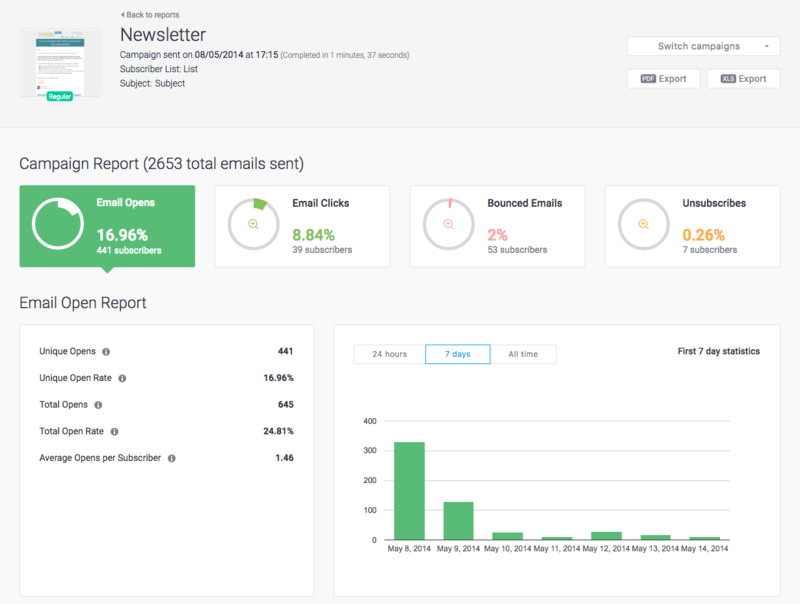 Email Campaign Reports: Can I Export My Reports? Mailigen allows you to export your reports to Adobe PDF and Microsoft Excel formats. From the report list, click on the actions button for the report you want to export and click the Save As PDF button. This will save a PDF version of the report to your computer. Note: An email with a download link will be sent if the size of the file is above 10k. From the Report Statistics Window, click on the Export PDF link to download an Adobe Acrobat PDF or the Export XLS Link to download a Microsoft Excel version. Note: You will need a copy of Adobe Acrobat PDF Reader to read the Adobe Acrobat PDF version of your report or a copy of Microsoft Office Excel to read the Excel version of your report. Can I export a report with several campaigns? Batch report export is also available. Date range – shows the period of time from which the information about campaign reports will be gathered. You can choose the interval between the start and end dates. By clicking the "Export" button with the desired file format (XLS or PDF), the system will create and prompt you to download the file with the requested report. Note: To open the exported report, you will need a program to read the selected format. We recommend using Adobe Acrobat Reader for PDF and Microsoft Excel for XLS format. As you can see from the list above, the XLS version is more suitable for analytics, and also allows you to calculate any additional characteristics using formulas, and PDF is more suitable for graphical representation of the results of the campaigns. Are Clicks on Social Sharing Links Tracked?